Just 90 miles north of Boston, there's a glorious little corner of Maine where lobstermen still command the sea, where shop owners greet their visitors like long-lost friends and where the time-warp charm of New England's old-world fishing villages takes us back to simpler times – back when leisurely summer evenings were spent on front porches enjoying soft ocean breezes and long winter nights were warmed by the company of loved ones, as a gentle snowfall blanketed the outside world in delicate lace. What's your fancy? A Victorian inn with a wrap-around porch overlooking the ocean? A luxurious Bed and Breakfast where rekindling romance comes easy? An elegant historic inn just steps away from charming shops and world-class restaurants? A grand ocean-side resort serving afternoon tea just like back in the 1920s, when the wealthy "summered" in Kennebunkport? No matter what type of accommodations you're looking for, no matter what price range you need, you'll find it right here – along with the five-star hospitality that small owner-operated hotels, inns and resorts pride themselves on providing five star service. 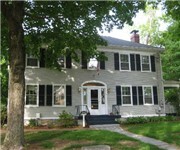 Captain Lord Mansion - Kennebunkport, ME – Welcome to the Captain Lord Mansion of Kennebunkport Maine! 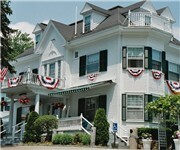 You are invited to experience the only AAA 4 Diamond Kennebunkport bed and breakfast inn. Imagine a relaxing Maine Inn and Spa or a romantic Maine getaway. Are you a discriminating traveler? Have you been deprived of a relaxing escape for some time? Your luxury lodging accommodations of Kennebunkport at the Captain Lord Mansion are meticulously decorated and designed to offer you a serene interlude filled with special romantic touches. What is the Captain Lord Mansion "Memory Garden" with its "Fountain of Love"? It is a serene and sunny flower garden that graces the spacious side lawn of the inn. It is comprised of 500 million-year-old, Appalachian bluestones paving the two angular paths and one circular path which surround a round fountain with a weathered copper statue of a couple cuddling in the "rain" under an umbrella. 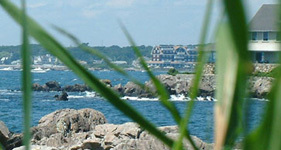 Shorelands Guest Resort and Cottages - Kennebunkport, ME – Shorelands Guest Resort and Cottages is located in Kennebunkport, Maine, one-quarter mile from Parsons Beach and one and one-half miles to Kennebunk Beach. Dock Square, located on the opposite side of the Kennebunk River in ""The Port"", is three miles away. This bed and breakfast offers accommodations including cottage and motel-style units. A guest cafe offers continental breakfast items including morning pastries and coffee for a fee. Barbecue grills, lobster cookers and vending machines are provided on the grounds. Fax service is available. An outdoor pool with accompanying hot tub is provided. Chetwynd House Inn - Kennebunkport, ME – The Chetwynd House Inn, a pristine 1840's colonial Sea Captain's home in a prime location on the Maine Coast. Kennebunkport's first B&B meets the needs of people on-the-go. Stroll to the ocean or shops. After an active day, return to your room lovingly prepared for your relaxation. Enjoy the handsome sitting room. Conversations with world travelers enrich your B&B experience. Honeymoon suites, with private baths, glow with the traditional and antique pieces. Wing chairs in soft hues flank tea tables. Join the camaraderie at the traditional board for Susan Chetwynd's "Sunday Breakfast Everyday". Susan Knowles Chetwynd's son Bob Knowles continues the tradition and sees to your well-being. Green Heron Inn - Kennebunkport, ME – The Green Heron Inn, one of Kennebunkport's historic Bed and Breakfast Inns, is located on Ocean Avenue, in one of the town's most charming neighborhoods. It sits adjacent to an estuarine cove, near the mouth of the Kennebunk river and just around the bend from President George Bush's vacation home on Walkers Point. The Green Heron Inn Bed and Breakfast is also just a short walk from a sandy beach and several fine restaurants, and less than a mile from Kennebunkport's picturesque Dock Square. Start your day with our sumptuous breakfast, which has been famous even among the locals here for over 50 years. Then enjoy your day with shopping, golfing, fishing, cruising, swimming, and other things to do in the area. Captain Fairfield Inn - Kennebunkport, ME – Set in the heart of Historic Kennebunkport, Maine, The Captain Fairfield Inn is Kennebunkport’s boutique bed and breakfast inn. 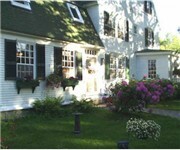 This Kennebunkport inn offers romantic and historic country inn lodging accommodations with luxurious modern amenities. Located in a quiet neighborhood overlooking the river green and just one block from the Kennebunk River and lively Kennebunkport harbor, this beautiful Federal home is listed on the National Register of Historic Places. An elegant and upscale Kennebunkport bed and breakfast inn, Captain Fairfield Inn has 9 guest rooms, each designed with the historic charm of our Federal mansion in mind yet with an edge to satisfy the desires of today’s discerning traveler. Captain Jefferds Inn - Kennebunkport, ME – Truly “A Very Special Place.” The Captain Jefferds Inn Bed & Breakfast in Kennebunkport, Maine is a warm and inviting 1805 sea captain’s home. From the time you enter through this Maine inn's red front door you will experience the charm, comfort and exceptional hospitality provided by these Kennebunkport innkeepers and their dedicated staff. Located in the quiet historic residential district, this Kennebunkport inn is surrounded by beautifully manicured lawns and gardens and is a quick stroll to ‘Dock Square,’ the village center of Kennebunkport. There you’ll enjoy specialty boutiques, art galleries, antique shops and a full range of restaurants from casual to five diamond rated. Waldo Emerson Inn Bed and Breakfast - Kennebunk, ME – The Waldo Emerson Inn is located in Kennebunk, Maine, next door to the ""Wedding Cake House,"" said to be constructed as a gift to his new bride by a guilt-ridden seaman. Kennebunk's Main Street, the Brick House Museum, and the Tom's of Main factory, offering tours and product samples, are within two miles. This 1754 Colonial inn is listed on the National Register of Historic Places, and is said to be the oldest remaining house in Kennebunk. Complimentary three-course breakfasts are served each morning at a massive oak table in the breakfast room. Complimentary coffee, tea, soft drinks and snacks are available throughout the day. The inn offers four guestrooms featuring handmade quilts, antiques, hardwood floors and working fireplaces. Cottages at Cabot Cove - Kennebunkport, ME – Whimsically intimate nightly accommodations in an idyllic cove-side setting, perfect for a romantic escape in Kennebunkport Maine. We are a cozy alternative to a bed and breakfast, b & b, or inn lodging experience...... a departure from the traditional. 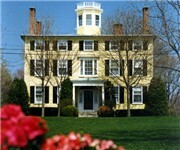 We have recently been named one of the most romantic places to stay in the country by bedandbreakfast.com. We'd like to invite you to come experience the romance of waterfront lodging at Cabot Cove. English Meadows Inn - Kennebunk, ME – Experience the romance, comfort and charm of our classic English "Country House" in a Kennebunkport bed and breakfast. The English "Country House" experience offers different delights regardless of the season. In the spring and summer, between the one hundred year old lilacs, natural day lilies, the traditional cottage roses, and perennial gardens, something is always in full bloom and our cutting garden supplies fresh flowers for the rooms. In the fall and winter, our fireplaces and afternoon Tea will warm up the chilliest days. The Kennebunkport Inn - Kennebunkport, ME – The Kennebunkport Inn - Kennebunkport, Maine’s quintessential classic New England inn - has been a renowned and timeless landmark Kennebunkport hotel in Kennebunkport since 1899. Once a tea merchant’s expansive mansion, the Kennebunkport Inn captures the classic elegant appeal of that era with a sophisticated modern blend of exceptional service and attention to detail. The warm and welcoming staff provides a rare blend of personal attention and knowledge to ensure an exceptional stay. You'll discover why the Kennebunkport Inn was selected as one of the Travel Channel's "Maine Best Escapes". The Kennebunkport Inn offers 49 casually sophisticated Kennebunkport hotel lodging accommodations located in the Main Inn or in the breezier beach cottage style of the Wharfside building. 1802 House Bed & Breakfast Inn - Kennebunkport, ME – This fine colonial home, built in 1802 and beautifully restored and updated, defines classic Maine coastal style. In a quiet, secluded setting bordered by the historic Cape Arundel Golf Course, you'll find romantic and elegantly comfortable lodging with all the amenities of a fine country inn. It's just an easy stroll along the Kennebunk River to Dock Square where you'll find outstanding shops, fine galleries and exclusive boutiques. Tides Inn By the Sea - Kennebunkport, ME – If you are looking to experience Maine in all its simplistic beauty, come to our corner of the world. The non-smoking Tides Inn By-The-Sea offers the simple charm of a turn-of-the-century Victorian inn nestled comfortably across from the beautiful white sands of Goose Rocks Beach. True to the Inn's unique character, each room has its own personality and décor. All bedrooms are moderately sized and newly refurbished. So what are you waiting for? With the Kennebunks centrally located to many points throughout New England, it's easy – and affordable – to get away for a quick weekend or for a few days.